Display Week, held in every May in Los Angles, is the world-famous Display Exhibition. As the raising attention toward Micro LED market, LEDinside will provide the latest display market news LIVE. At the same time, LEDinside are going to do interview with Christopher Bower, the CTO of X-Celeprint to share their extraordinary display technology in 2018. Aside from LuxVue which was acquired by Apple, X-Celeprint is another company that owns complete patent in Micro LED industry field. The mass transfer technology which X-Celeprint has adopted through unique Van Der Waals' Force has successfully attracted many partners and investors. Finally, X-Celeprint is showing full-color Micro LED Displays with 5.1 inch during SID 2018. 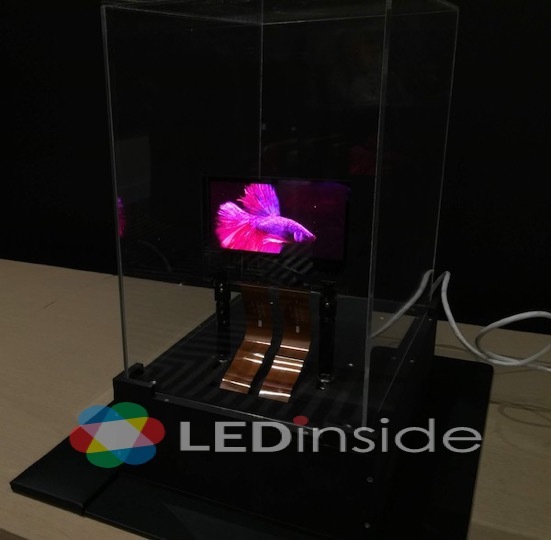 According to the LIVE observation of LEDinside, three demonstrations of Micro LED full-color displays of X-Celeprint possessed with the same specification. Due to their self-emissive screens, the brightness, color contrast and video playing fluency performed very well. Christopher Bower, the CTO of X-Celeprint, revealed that this 5.1-inch-full-color display uses 8 x 15 micron Red, Green and Blue Micro LEDs at 70 ppi resolution. Besides, it is combined with Micro IC, an active matrix driver, instead of TFT backplane. Therefore, it can play every animation fluently. Christopher also explained that X-Celeprint, rather than focusing solely on mass transfer, has developed strategies and intellectual property around many front-end and back-end aspects of Micro LED displays. For instance, X-Celeprint develops redundant and repairable pixel architectures for back-end finishing of displays, which is of high concern in the industry. The demonstrations during the exhibit are also produced based on this technology. In addition, as for the most concerned technology, mass transfer, the size of the elastomer stamp used to fabricate the display prototypes is 15mm, it can precisely and selectively pick up the micro-component array and print the array to the object substrate by combining precise motion control with a microscope that looks through the transparent elastomer stamp. The transfer yield is 99.99% and is steadily improving, which substantially lowers the back-end repair cost. X-Celeprint considers that future mass transfer throughput improvements will be achieved through increasing transfer speed and scaling to larger transfer areas. The company has already reported high transfer yields using stamps that are 130mm in dimension.As a result, huge growth of capacity can be expected in the future. Kyle Benkendorfer, the CEO of X-Celeprint, shared their future business strategies with LEDinside. So far, X-Celeprint has already found various business partners and strategic investors, including the patent authorizing of Micro-Transfer-Printing with OSRAM and the project of collaborating with equipment manufacturers to develop mass transfer equipment. X-Celeprint will keep open-minded toward every kind of cooperation in the future.